You are also allowed to cast videos to Chromecast through the Chrome brower. Which means you have to install the Google Cast extension for the Chrome browser on your PC or Mac. After downloaded and installed the Chromecast app, drag and drop the video you want to wactch into the Chrome browser. Press the Cast button in the Chrome toolbar of your browser. Once the video is played in Chrome browser, you can send it to TV through Chromecast using the Google cast extension. To cast videos to Chromecast from mobile devices like smartphones and tablets, the Chromecast app is essential. Namely, first of all, you have to find and download the Chromecast app and have it installed on your Anroid or iOS devices. Then just launch the Chromecast app on your device and click Cast Screen button. Play the videos you would like to see on your devices, then you can get videos play in full screen. Preparation– One app currently accessible with Chromecast is Allcast for Android, which allows you to stream personal videos, music, and pictures straight to your television. But there’s still a few kinks to work out in it, and it’s only available for Android, leaving iOS 7 devices out in the cold. Thankfully, another app has been added to the Chromecast family called RealPlayer Cloud, which best of all, lets you stream from both Android and iOS 7 devices. With RealPlayer Cloud, you can stream any personal videos on your device, or uploaded to RealPlayer’s cloud, and stream them through the Chromecast HDMI dongle on to your television. All you have to do is sign in (or sign up if you don’t have an account) and all of the videos on your device will appear under the My Videos tab. As well as personal videos, you’ll be able to stream web videos that are popular, as well as ones shared on Facebook (if you use the Facebook login option). To stream videos from Apple devices, make sure you install the RealPlayer Cloud app for iOS. With it open, just tap on My Videos and then select All Videos from the tab at the top. Now tap on the casting icon on the upper right and select your Chromecast device. 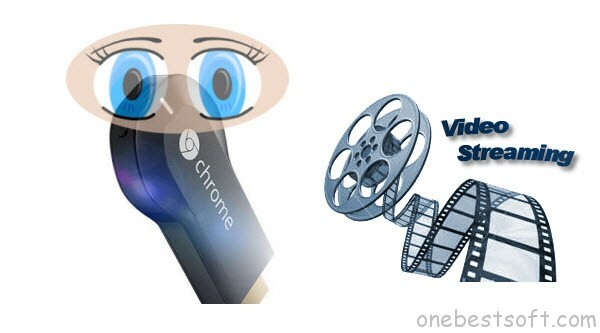 Once it connects to Chromecast, select your video and you’ll see it stream to your television. You can use a smartphone or tablet to watch or listen to content from several sources, including Netflix, YouTube, Pandora, HBO Go, Google Music, Vevo, Plex, Hulu Plus, and Google Movies & TV. In each of those apps, you simply press the “Cast” icon and select your Chromecast, and the video gets sent to your TV. Note: Easy-to-use and convenient as it is, Chromecast is very limited in the input video formats. In other words, chances are that you have stored tons of videos, in formats like AVI, FLV, WMV, MPG, MOV, etc, that are not supported by Chromecast, then you have to convert those videos into Chromecast compatible ones for streaming. Here Pavtube Video Converter Ultimate is a top Chromecast Video Converter which can easily convert various formats and tons audio files to Chromecast supported video format for sharing with your family or friends on TV. Mac version is here. Free download it and start to steam all supported and unsupported videos from computer or mobile devices to your Chromecast. Have more issues about Google Chromecast? Get more solutions here.